Recently, the London Writers Society held the second event of its Firearms Field Trip, and again the result was an informal adventure that was informative and artistically inspirational—and just plain fun! Sixteen members of the LWS (including several spouses) had a crack at using several types of handguns: a .22 target pistol, a wild west .38 six-shooter, and a thunderous .45 automatic. Mike Mitro, the instructor who hosted our group at the Crumlin Sportmen’s Association’s indoor handgun range, also provided a display of many other handguns and answered everyone’s questions. And as a bonus, everyone got to take their personal paper targets home as a record of their shooting skill (or infamy). The day proved so enjoyable that several participants (and some other LWS members) expressed an interest in finding another opportunity to shoot again, and potentially even taking up the sport of target shooting. So, I compiled a basic FAQ, which I posted elsewhere and will attach below. For people who want to try handguns or just dabble with them a bit more, the handguns instructor who hosted us at the Crumlin Sportsmen’s Association range has informed us that the CSA (http://www.crumlin.org) regularly hosts “new shooter” nights for handguns on Thursday evenings, from 5:30 to 7:00. 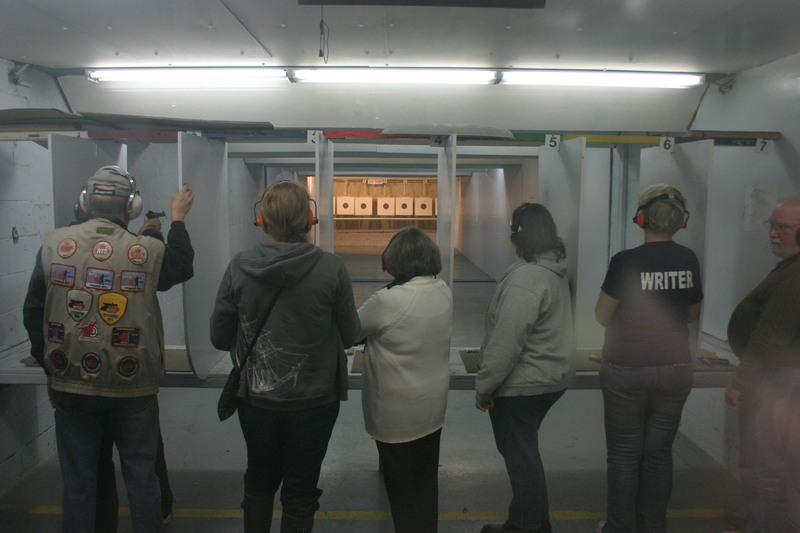 During these evenings, any member of the public interested in trying handguns can go out to the association’s range and try their hand at shooting. I gather that the costs are similarly as modest as they were for the London Writers Society’s recent field trip. The handguns instructor, Mike Mitro, only asks that any new shooters inform him by email beforehand that they will be attending one of these “new shooter nights,” so that he can adjust what equipment, ammo, etc., that he will bring out on that evening. Mike’s email is attcrumlin@gmail.com. For those people who have indicated an interest in taking up handgun (or shotgun) shooting as a sport, they will need to get safety certification. As I understand it, that certification includes taking a Canadian Firearms Safety Course (CFSC) if you want to use shotguns, plus a Canadian Restricted Firearms Safety Course (CRFSC) if you want to use handguns. The next CFSC course being held at the Crumlin Sportsmen’s Association is January 3 and 4th, with a CRFSC course to follow (date to be determined). (Personally, I’m taking these courses; and I’m told that they tend to fill up.) These courses are taught by Sue Rueger, and the costs etc are on her website: http://www.firearmsafety.ca/. Those wanting to take up shooting sports will also presumably want to become a member of the Crumlin Sportsmen’s Association. Orientation nights for potential new members are held at the club at 7:00 pm every third Wednesday of the month. More info here: http://www.crumlin.org/membership/membership-process.htm. This entry was posted in Uncategorized and tagged field trips. Bookmark the permalink. Sounds like another great field trip! I am looking forward to going in the new year! Someone who lives in Canadja. Hana’s entitled to make jokes like this because she did live here once, in the northern civilized part of North America. Thanks, Richard, for hitting the target right in the centre.